The United Nations mission in Kosovo has ruled that Serbian Orthodox officials can continue building a protective wall around a church that serves as its local seat. The executive order, issued by Kosovo's top U.N. official Joachim Ruecker, overturned a decision by local officials in the western town of Pec. It will stay in force until the disputes are resolved, said U.N. spokesman Alexander Ivanko. Kosovo's local reform minister, Lutfi Haziri, had asked the U.N. to suspend the decision of municipal officials to stop works on the wall. The local officials had claimed the church did not receive permission to build the wall. The Patriarchate of Pec claims it needs the wall to protect the church, which is in an ethnic Albanian area, as well as the nuns and monks inside. Sandbags can't stay there forever and the day will come when Italian soldiers leave and we will need protection and security," a nun identified as Haritina told the province's KiM Radio. 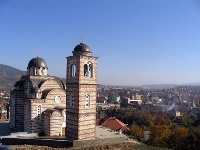 Kosovo was the seat of the medieval Serbian state and the Serbian Orthodox Church. The Serbs cherish it as the cradle of their history and culture but the province's ethnic Albanians want it to be independent. Most of the Serb Orthodox churches in the province are guarded by NATO peacekeepers after they were targeted in ethnic attacks when Kosovo was placed under U.N. rule following Serb forces' crackdown on ethnic Albanians. A U.N. plan that recommends internationally supervised independence for Kosovo would also establish protective zones around more than 40 key religious and cultural sites.